There is gold - gold! - waiting to be found in the deserts of California, Arizona, New Mexico, Utah and Nevada. 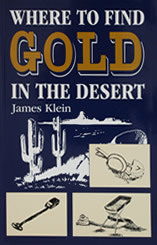 This book is the key to making your next trip into the desert a little "richer" with a gold-hunting expedition. Paperback, 135 pages, 5.5" x 8.5".